EXCITING BUSINESS OPPORTUNITY --- own your very own canoe and kayak outdoor adventure store! 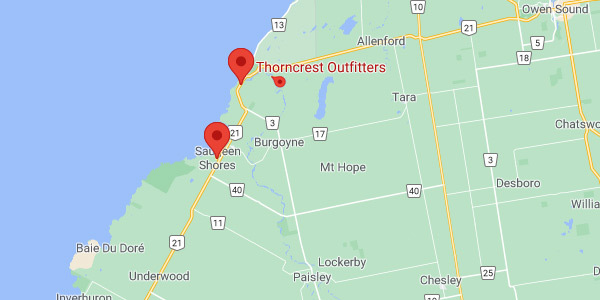 Thorncrest Outfitters is your outdoor adventure centre for canoe, kayak, bicycle, hiking, birding and winter pursuits. Complete canoe and kayak trips on the Saugeen River, as well as open water paddling on Georgian Bay and Lake Huron. Our stores stock quality outdoor clothing and all of the gear you will need for your adventure. Get all the gear you need for your outdoor adventures - from boats to camping gear, clothing, water filters and more! 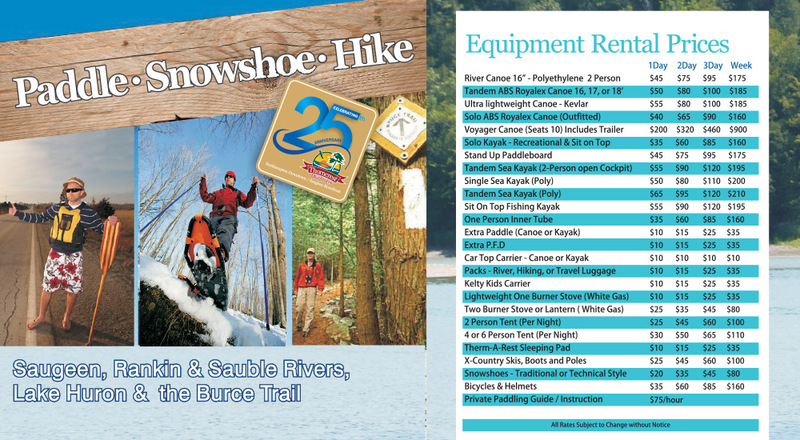 Take advantage of our equipment rentals for your outdoor adventure - boats, carriers, packs, tents, bicycles and more! Fully insured shuttle service to drop points along the Saugeen River and up the Bruce Peninsula to Tobermory. Custom destinations available upon request. This one day tour is offered for the beginner kayaker to learn some basic paddling skills and then explore the many islands and waters offshore of Oliphant known as the "Fishing Islands"
Our furthest offshore trip, visiting the largest of the islands found in Fathom Five National Marine Park. This island jewel has it all, with rugged shorelines, impressive scenery and the majestic Cove Island Lighthouse. Check out our constantly changing inventory of previously loved outdoor equipment. Great deals. Be sure to check our calendar for upcoming events, guided package tours and more. Tobermory location open for 2019 season May 17th. A special paddle event in conjunction with the Rotary Huron Shore Run. A short afternoon paddle from County Road 3 to Denny's dam (approximately 2 hours). Lowered cost on boat rentals for Shore Run participants, reservations in advance required.